The step21 media box combines interactive tools and classiccomponents for educational background, particularly with regard to personal responsibility and social skills. The step21 youth foundation is supported by the Gouverment of Youth & Family. Specials: dvd-video incl. feature film “Kick it like Beckham” and related step21 bonus material, CD’s incl. comic software, radio & music software, Audio-CD. Die step21-Medienbox [Zukunft : Identität] bietet inhaltliche und methodische Anregungen zur Vermittlung grundlegender sozialer Kompetenzen wie Eigenverantwortung, Konfliktfähigkeit, Teamfähigkeit und Engagement. Die Initiative step21 wird unterstützt vom Bundesministerium für Familie, Senioren, Frauen und Jugend. Die DVD enthält u.a. den Kinofilm “Kick it like Beckham”, sowie thematisch aufbereitetes zusätzliches Videomaterial. 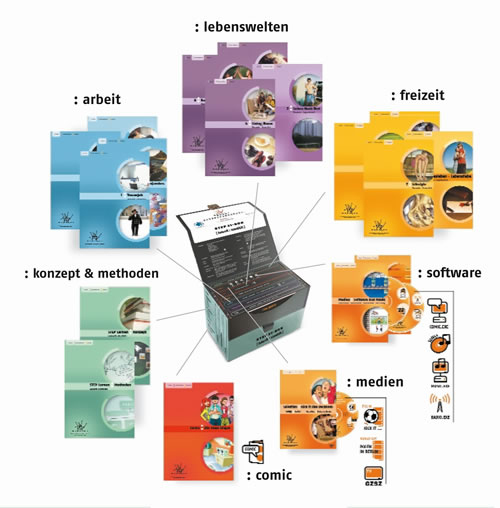 Die CDs enthalten Comic-, Radio- & Musik-Software inkl. Audio-CD.